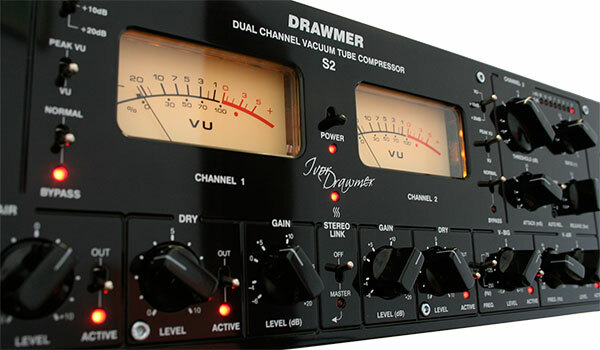 The S2 is a Two Channel Tube Compressor introduced in 2008 from Drawmer's Signature Series. It has some great features that gives many creative options when it comes to dynamic control. "The S2 Signature Series Dual Channel Tube Compressor is one of the latest products to emerge from Ivor Drawmer's high end designs and offers an ‘all tube - no technical compromise' circuit using only the highest grade components. The S2 features a host of new creative processing possibilities never before found in an all analogue dynamics package. V-BIG: Retains bass frequencies and minimizes undesirable ‘pumping' by rolling off the detection signal at 75, 125 or 250Hz (user switchable). A fully variable level control allows for the desired amount of Big processing and an in/out switch provides the option to remove from the signal path for A/B comparison. V-BRIGHT: A dynamic high frequency enhancer to keep compressed audio sounding fresh and bright with continuously variable frequency control (500Hz to 20kHz) and amount of dynamic enhancement. DRY: Mixes user defined amount of ‘uncompressed' signal with the compressed signal to create ‘parallel compression effect' without the need for external mixing devices."